Intra-articular fractures of the tibia plafond are among the most challenging of orthopaedic problems. This is a retrospective case-control study of surgically treated pilon fractures which was undertaken to compare the internal fixation with the two external fixation methods. This is a case-control study of 55 patients with 55 pilon fractures. There were 36 type C and 19 type B. Of these fractures, 24 were open and 31 closed. Three surgical protocols were used. In 20 patients, Group A, a half pin external fixator with ankle spanning was performed. The mean age of patients was 42.0 years (22.0–74.0), SD 14.1 and the mean follow-up was 77.7 months (38.0–132.0), SD 25.4. In 22 patients, Group B, a single ankle sparring ring hybrid external fixator under a small arthrotomy was performed. The mean age of patients was 48.4 years (28.0–76.0), SD 12.4 and mean follow-up was 67.9 months (36.0–132.0), SD 27.8. In 13 patients, Group C, a two-staged internal fixation was performed. The mean age was 45.6 years (30.0–66.0), SD 9.7 and the mean follow-up was 78.6 months (55.0–132.0), SD 25.4. We addressed the dissimilarity of the type of fracture in each group performing supplementary stratified analyses within each fracture type group. Group A had union in 6.9 months, group B in 5.6 months and group C in 5.1 months; P = 0.009. Six patients (Group A), two (Group B), and one (Group C) had limitation of ankle motion; P = 0.47. One patient from group C developed infection and the plate was removed. Four patients (Group A), one (Group B), and one (Group C) have developed posttraumatic arthritis (loss of joint space and pain); P = 0.25. Seven patients from Group A have reduced their activities; P = 0.004. In stratified statistical analysis by type of fracture, the associations noted for both fracture groups combined were also noted separately within each fracture group. In this long term follow-up study, the two-staged internal fixation and the hybrid fixation with small arthrotomy were equally efficacious in achieving bone union. 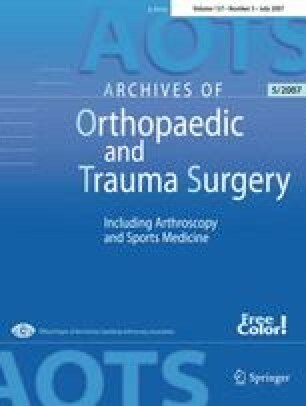 Patients in external fixation with the ankle spanning had a significantly higher rate of delayed union. Also more patients in this group have reduced their activities. Meeting at which the paper was presented: International Annual Meeting Of Orthopaedic Surgeons, 2003, Greece. The corresponding author thanks Dr. Scarmeas MD, MS for his help in statistical analysis of the data in the study.